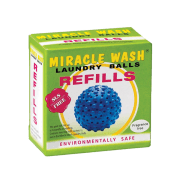 The Miracle Wash ® laundry balls DO NOT contain…. The Miracle Wash ® laundry balls contain small pellets made of minerals, during the wash these minerals release molecules of ionised oxygen and raise the pH level of the water. 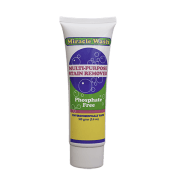 The minerals are sodium silicate and sodium carbonate as well as a mild and biodegradable surfactant. The Miracle Wash ® laundry balls will not pollute rivers or water ways and contains no harsh chemicals so the grey water can be used to water your plants. They are safe to use in the Eco Septic Tanks as they do not contain toxic chemicals and the alkaline pH will help reduce bacteria. 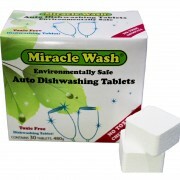 They do not contain added anti bacterial agents, the minerals have natural anti bacterial properties. You can reuse them over and over again (up to 60 washes actually) and they have a little cap that you pull out and pour in your refill pellets. You are recycling the balls each time you refill them and there is no wastage or disposing of plastics into the environment. 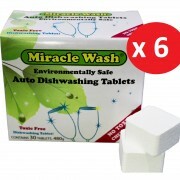 The Miracle Wash Pellets do not contain Petrochemicals, Boron, SLS, Colouring, Animal derivatives or Toxic chemicals that are harmful to your health or environment. Comments from Dr Robert Petterson After testing the Miracle Wash Laundry Balls. service guys reckon our system is in perfect condition and just about maintains itself.